Preserving California's Japantowns is the first statewide project to document historic resources from the numerous pre-World War II Japantowns. With an expert advisory committee,we developed this list of 43 communities to include representation across the many regions of the state, and ensure that distinctive economic characteristics and cultural features associated with diverse Japantowns were represented. Linking the past to the present, the PCJ Project Survey identifies over 3,500 businesses and organizations from pre-war Japantowns that is searchable by region, community, and historic use. 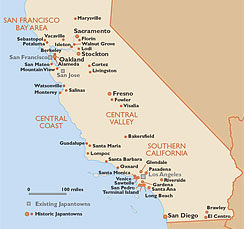 The project has enlisted many individuals and organizations through training workshops and regional forums that introduce Preserving California's Japantowns, assist communities in recognizing and preserving their local heritage, and connect them to our statewide effort. Reclaim the stories of buildings and landscapes of California’s historic Japantowns, including the majority of Nihonmachi that were transformed following WWII internment. 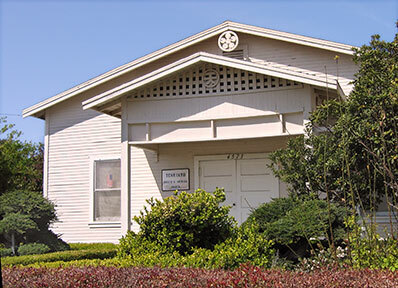 Identify and evaluate the significance and physical condition of historic buildings and landscapes associated with Nihonmachi across California. Gather Nisei memories of California’s Japantowns that have not yet been well documented. Capture the diverse historical experiences of the state’s Nikkei, from residents of urban Japantowns that featured a wide range of community institutions and services to those who worked and lived in smaller communities across the state’s rural and suburban landscapes. Sponsored by the California Japanese American Community Leadership Council (CJACLC), the project builds upon California State Senate Bill 307, which provided funding for the development of plans for the historic and cultural preservation of the remaining Japantowns in Los Angeles, San Francisco and San Jose. Major funding support is provided by the California State Library through a grant from the California Civil Liberties Public Education Program. This project has been funded in part by a grant from the California Endowed Fund of the National Trust for Historic Preservation. 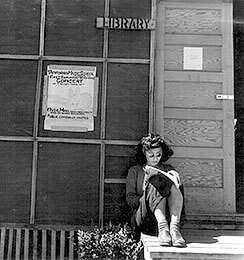 Preserving California’s Japantowns staff has developed a draft California Japantowns Bibliography to aid our research and to support work by others that document Japanese American heritage. ››READ MORE. 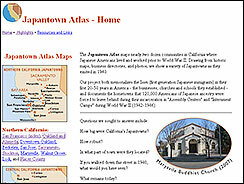 This project recreates over 20 California Japantowns as they appeared in 1940, on the eve of the internment. Maps drawn from old directories and insurance maps show the variety of Japantowns from urban centers to farm towns and company towns. ››Click here for more information. 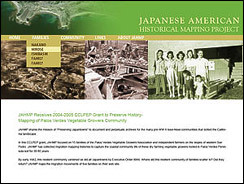 This project documents the Japanese American dry farming communities on the Palos Verdes Peninsula-San Pedro slopes. A CSULB-GIS database has been established to identify ranch sites through 1928 and 1945 aerial photos and related base maps. ››Click here for more information.